VICTORIA, B.C. 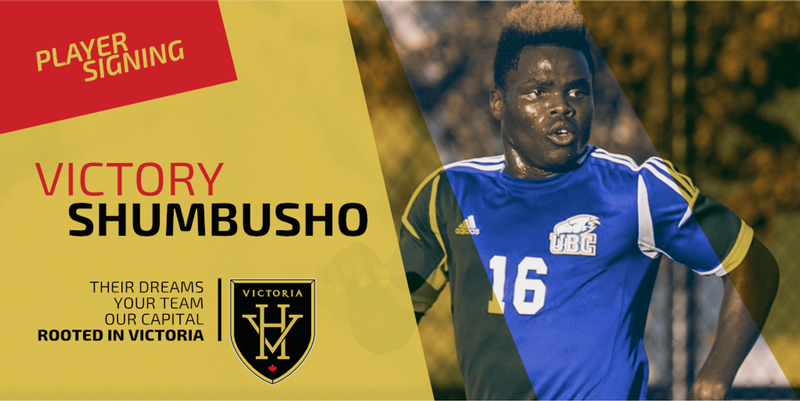 – The Highlanders are pleased to announce the signing of Victory Shumbusho, pending USL league and BC Soccer approval. Shumbusho, a forward with the UBC Thunderbirds, is the second addition to Thomas Niendorf’s USL League Two squad. Shumbusho joins the Highlanders after having just completed his second year with the Thunderbirds. His 2018 UBC campaign saw the Thunderbirds capture their second-straight Canada West title, while the Burnaby Central Secondary grad finished with six goals and two assists for a run of 14 points in 13 matches. While his offensive numbers are notable, the 21-year-old brings a well-rounded game to Niendorf’s squad. Having moved from the Democratic Republic of Congo to Canada six years ago, Shumbusho landed in Chilliwack. From there he joined the local soccer club, Chilliwack Attack, before he was noticed by the Whitecaps Residency program in 2016. The 2017 campaign saw him join UBC where he went on to win the 2017 Canada West Rookie of the Year. With his prowess on the ball and around the net, Shumbusho is excited to join the Highlanders for their upcoming season.